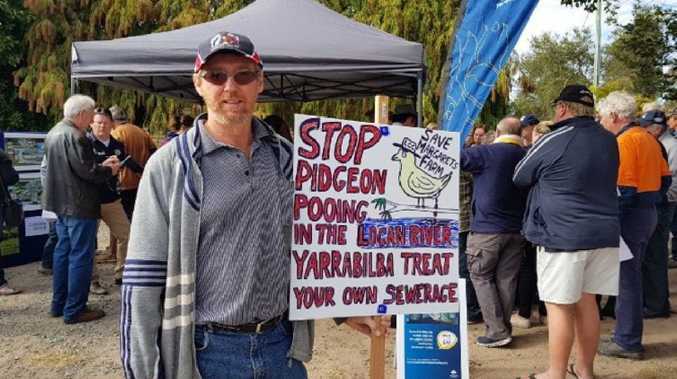 Stockleigh resident Leeroy Bobermein with his poo placard. A WAR over poo has broken out in Logan's emerging growth suburbs. Logan City Council's plans to buy or resume about 80 hectares to build a new treatment plant sparked the stink. 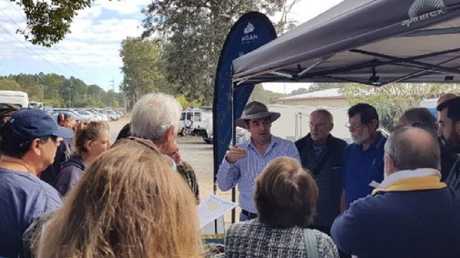 Council said it was necessary to cope with waste from two growth areas - Logan City Council's Park Ridge estate in the north and developer Lend Lease's Yarrabilba in the south. The issue came to a head on Saturday at the last of three council-run community consultation meetings when 40 residents were told council was looking to find an ideal sewage plant location in the area. Residents at a council-run community consultation about the site of the sewerage plant. Council commissioned an independent report into a new treatment plant when it realised its Loganholme treatment plant, currently processing sewage from Park Ridge, would hit capacity by 2020. The report, by engineers Cardno, identified three plausible sites between Park Ridge and Stockleigh but it was never adopted by council. Plans included buying property or resuming it with conditions for purchase including being close to the Logan River. Yarrabilba residents were angry their neighbouring emerging suburbs were blaming them for creating the extra waste. Logan councillor Laurie Koranski with residents at Saturday’s meeting to discuss the site of a new sewage plant. Councillor for Yarrabilba Laurie Koranski said she did not want her electorate to be left carrying the can. "This is one of the fastest-growing areas in the state and needs a sewage plant but less than half of the poo is from Yarrabilba so it's not fair to assume it should go in Yarrabilba." 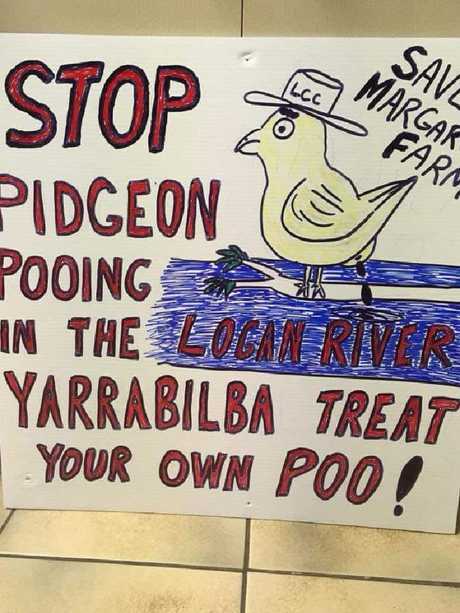 Long-time Stockleigh resident Leeroy Bobermein put his gripe on a placard blaming another local councillor, Phil Pidgeon, for "pooing in the Logan River". 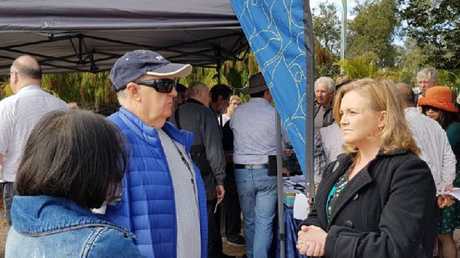 "I believe council has already got plans for where it is going to build the plant which is on Margaret Hawkins farm (at Stockleigh) and she doesn't want to sell," he told the gathering. A sign created by Leeroy Bobermein. Cr Pidgeon said there were no plans to compulsorily acquire land and ruled out siting the plant on Mrs Hawkins' farm. "The state government has some serious explaining to do as to why it did not, and still has not, forced Lend Lease to install a wastewater plant to service its huge development," he said. "This should have been done as part of the original state approval of Yarrabilba. "Council and its residents should not be left with this. It stinks. "It is yet another sweetheart deal that is having impacts on residents in surrounding areas." Cr Pidgeon, the chair of the council's water and waste committee, said 45 per cent of the waste to be treated at the new plant would be from Yarrabilba, 5 per cent was from Logan Village with the other half from Park Ridge, Chambers Flat and Logan Reserve. There are still another 10 days for Logan residents to have their say about the sewage treatment plant.